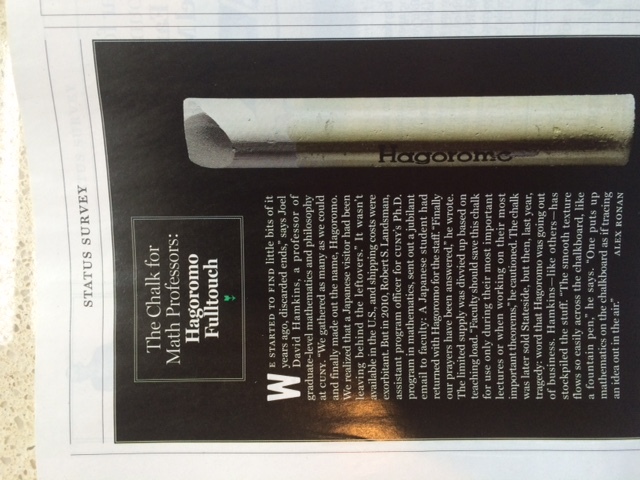 The Chalk for Math Professors: Hagoromo Fulltouch, by Alex Ronan for the current issue of New York magazine, part of the Status Survey on various items for professionals. The smooth texture flows so easily across the chalkboard like a fountain pen … One puts up mathematics on the chalkboard as if tracing out an idea in the air. Meanwhile, I happened to be at a conference at the Research Institute for Mathematical Sciences in Kyoto last week, and I gave my talk using the chalkboard and the plentiful supply of Hagoromo chalk provided there. This entry was posted in Asides and tagged in the news by Joel David Hamkins. Bookmark the permalink. Last semester there was someone who had a bunch of these, and used one of the seminar rooms before the set theory lectures began. 1. It is in fact very smooth, and very nice chalk to write with. 2. It is impossible to clean it properly without water. If the guy before you used anything but white chalk, you’re in for a heap of trouble. 3. If it does gets on your black pants, it will stay on your black pants. Don’t wear black pants. And maybe because it was the stump of the chalk, but I felt that my fingers weren’t less dirty after using it. But I can believe that in a place where every room has a sink, so you can use water to clean up the board, and with a brand new stick of chalk it can be an excellent writing experience. I’m surprised by your comment, since I haven’t had any issue with clean-up. Indeed, for me, it has easier clean-up than usual: it erases easily just with a regular eraser, in fact, more easily than ordinary chalk, and there is very little dust. I gave a two-hour lecture on Monday, and it took less than one stick of chalk, whereas ordinarily I use three or four regular sticks. It took a long time until the yellow smears were reduced to a reasonable level. Oh, I thought you were talking specifically about the Hagomoro Fulltouch chalk, which is white. Yes, I agree, with poor quality chalk, it can be a mess. No. 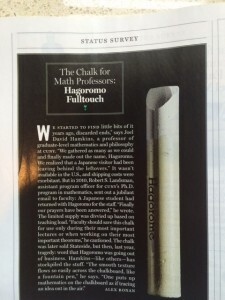 I was talking about the Hagomoro Fulltouch chalk (or at least the stump of something that looks almost the same). But whoever was leaving these stumps behind also left a bunch of yellow chalk stumps of the same maker, quality, density and size. Along with that special coating and the end of the name written on the side. The usual low quality chalk that we have in HUJI is bad, but manageable for the most part. 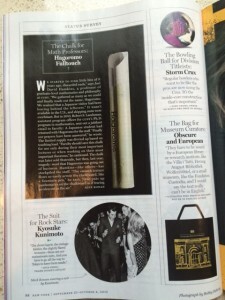 It isn’t only about chalks, is it? Blackboards, erasers are much better there. I highly doubt fingers get any dirtier than ordinary ones, as they have got this slick coating so that you don’t get unpleasant white powders all over your fingers after using. It is interesting to know that the first report for the existence and usage of blackboard in the classrooms goes back to 11th century in the book, “History of India” (also known as “Indica”), written by an Iranian mathematician, Biruni, who visited India during a scientific journey for meeting Indian mathematicians and scientists and knowing more about the life style of Indian people. They use black tablets for the children in the schools, and write upon them along the long side, not the broadside, writing with a white material from the left to the right. Unfortunately both of the birth and burial places of Biruni (Khwarezm in Uzbekistan and Ghazni in Afghanistan respectively), are located out of the current political borders of Iran while all these vast areas of land was just a small part of what is called “Greater Iran” by historians. I have never visited these former Iranian cities. I don’t know at the end which will capture the entire universities and research institutes of the world, blackboards or whiteboards! Personally in this chess game I fight alongside of the white company because I feel a bit uncomfortable while using chalks, particularly because the remaining of the chalk sticks to your hands and you always need to wash them after using a blackboard even for a short time! It is not a good news for those, like me, who are obsessed with keeping their hands clean! Add to this, some visibility and erasing problems in using chalkboards and even some serious breathing problems for those who suffer from Asthma and Allergies. The bad quality of some chalks is the least problem while talking about a blackboard! Recently also a third company came to play in this war competing with both white and blackboards! It seems “smartboards” and other types of “electronic boards” are trying to take the place of their elder ancestors! Who knows whether they will win the competition or not?